Orbital, Editors and Ocean Colour Scene will headline a new festival with takes place in the Midlands this summer. The inaugural Beyond The Track festival will be at Birmingham’s Eastside City Park from September 15 to 17. Its line-up features some of the most revered names in UK music alongside some of its brightest new stars. The opening night will be headlined by electronic music pioneers Orbital who were one of the key acts responsible for taking electronic music into the mainstream and out of clubs and into live venues and festivals. Joining Orbital on the Friday will be seminal electronic act Leftfield, Faithless and Jagwar Ma. On Saturday, local heroes Ocean Colour Scene will take to the stage for a euphoric hometown headline performance. With a huge catalogue of hits including The Riverboat Song, The Day We Caught The Train, Hundred Mile High City, their hit laden set will have the city reverberating to their guitar anthems. Also playing that day will be Maximo Park, The Coral, The Twang, Carl Barat and The Jackals, Jaws, Superfood, The Americas, Health & Efficiency and Welsh pop-punk outfit The Sandinistas. The festival will be brought to a close on the Sunday night by Editors. 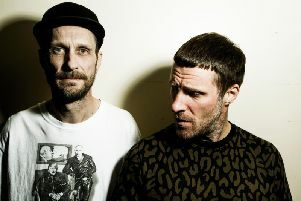 Over five albums, the band’s alternative rock, synth heavy, rumbling basslines and electronic tinged anthems are big and bold as evidenced by hits including Munich, Blood and Smokers Outside The Hospital Doors. Joining them will be The Jesus and Mary Chain, Wild Beasts, Peter Hook & The Light, Nadine Shah, Josefin Ohrn + The Liberation, Goodnight Lenin, Blackash, Victories At Sea and Dorcha. Beyond The Track is at Eastside City Park in Curzon Street station, Digbeth. Tickets are on sale from Friday, April 14 and cost from £45 for day tickets.